Yes, you read that right and, sadly, it isn’t a joke. Starting today (April 2) NASA has suspended contact with representatives of the Russian government and not working with Russia’s space program until otherwise stated. The only exception is in regards to the International Space Station, where NASA and Russia will continue to interact with each other. This decision is a response to the Russian invasion of Crimea and their violation of Ukraine’s sovereignty. Given Russia’s ongoing violation of Ukraine’s sovereignty and territorial integrity, until further notice, the U.S. Government has determined that all NASA contacts with Russian Government representatives are suspended, unless the activity has been specifically excepted. This suspension includes NASA travel to Russia and visits by Russian Government representatives to NASA facilities, bilateral meetings, email, and teleconferences or videoconferences. At the present time, only operational International Space Station activities have been excepted. In addition, multilateral meetings held outside of Russia that may include Russian participation are not precluded under the present guidance. If desired, our office will assist in communication with Russian entities regarding this suspension of activities. Specific questions regarding the implementation of this guidance can be directed to Ms. Meredith McKay, [deleted contact information], in our office. 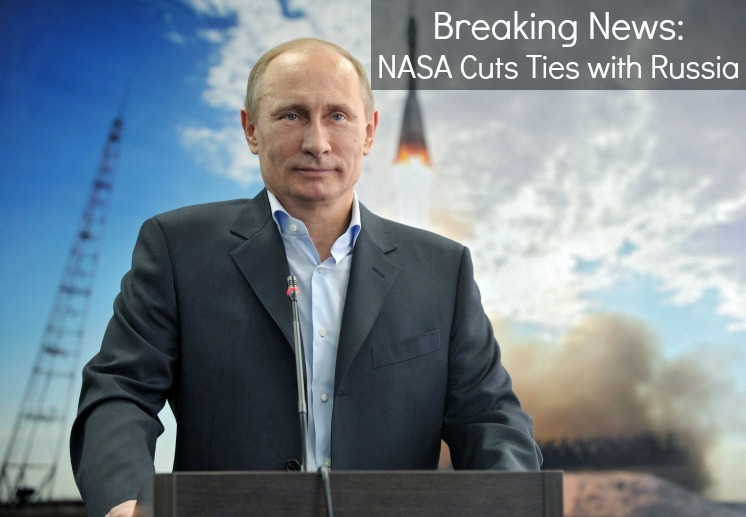 1) NASA won’t communicate with Russia beyond things concerning the ISS and this suspension. 2) NASA will still participate in international conferences, seminars, and such even if Russia attends. 3) NASA will still use Russia’s Souyez rockets to get U.S. Astronauts to and from the ISS (though, there has been a lot of concern about America’s reliance on a foreign government for all of our manned-space ventures. NASA’s G+ statement basically said they were working on a resolution to that concern). 1) There are currently two Americans on-broad the ISS. The next batch of crew members are expected to launch from Russia on April 9, one of which will be an American. As new information becomes available, we will let you know and update.